I showed you my gouty necklace find that I snapped up at Notting Hill. I was SO in love with the necklace that I wore it the day after I got it… actually I wore it that night, but sadly I don’t have a picture. LOL! Yeah I’m that girl. Whenever I get something new I have to wear it or use it that day or the following day to show it off. I was meaning to take a little more formal lookbook picture of the outfit in my room but I woke up late that morning and had to rush getting ready so that I could make the checkout time. So sorry if this picture is a little ghetto-fied. I took it while I was trying on dresses in the fitting room at Zara’s. LOL. Along with bows, I’m really obsessed with stripes right now. 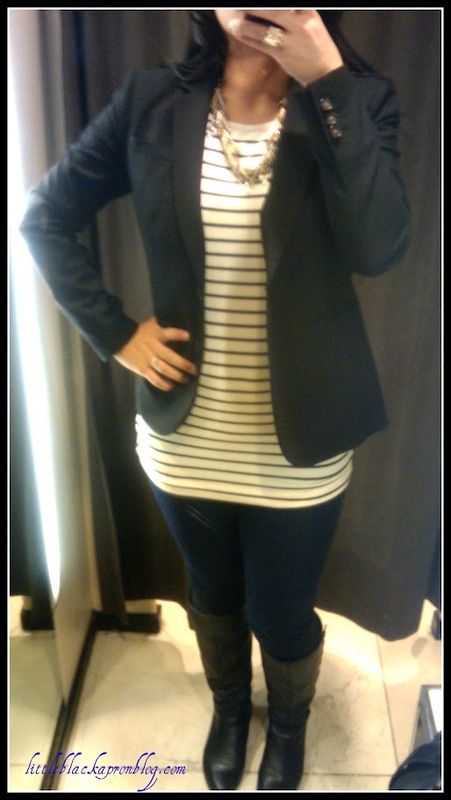 It’s been my go to outfit: striped shirt, blazer/cardigan, short/jeans, necklace, accenting shoes. DONE. Run out of the house. I’ll be posting another post with a striped blouse soon. The common misconception with stripes is that it’ll make you look bigger. I used to think that, so I stayed away from the trend; however, lately I’ve embraced it. It really is about the quality of the fabric, the complete outfit look, the size of the stripes and your frame. For me, because I’m petite but a little thicker than most asian girls, I find that smaller stripes work. I stay away from tops that have larger stripes, which is what I used to wear before because I thought that was slimming. I look at pictures from a couple years ago when I was wearing the larger striped trend and I was not too happy. Grant it I was a little heavier, it was not a good look for me. Key tip here: Know what best works for you. When in doubt, take a picture of yourself (as vain as that sounds), to see how the outfit looks. I’ve surprised myself in how different outfits look in the mirror versus digital picture. In other news, I’ve FINALLY changed the name of the blog and the domain name to LittleBlackApronBlog.com, hence the new tag above. It’s an ode to the little black dress, black pumps, and the apron that keeps your clothes clean while in the kitchen cooking up that delicious dinner. Corny I know, but I like it. In the coming weeks, you’ll see a new banner and pictures being tagged differently, along with some other changes I hope to put together with the help of my hubs. 🙂 Stay tuned!